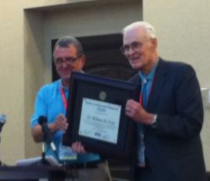 It is with deep sadness that I write to announce the passing of Dr. William (Bill) Gray to the tropical meteorological community. He was one of the most influential meteorologists of the past 50 years. He was also an incredible advisor, a fantastic mentor and a great friend. I will post a eulogy that I have written for him shortly (ICECAP note: called A Lighter Shade of Gray it was posted here). I have appended his formal obituary below. William Mason Gray (Bill) passed away peacefully surrounded by his family on April 16th, 2016 at the age of 86. He had remained active in his hurricane and climate change research up until the time of his death. He was well known for his seasonal Atlantic Basin hurricane forecasts and his strong disagreement with the scientific basis of the anthropogenic global warming hypothesis. Bill was born in Detroit, Michigan on the 9th of October, 1929. He was the eldest son of Ulysses S. Gray and Beatrice Mason Gray. The family moved to Washington D. C. in 1939 where Bill grew up in the northwest section of the district. He graduated from Wilson High School and George Washington University (1952) and was very active in high-school football and baseball. A knee injury at 21 prevented a desired career in professional baseball. Bill received a 2nd Lt. commission in the Air Force in 1953 and served as a weather forecast officer for four years, the majority of which was overseas (Azores, England). He remained active in the Air Force Reserves after joining CSU as a weather officer until 1974 when he retired as a Lt. Col. After his active Air Force duty in 1957, he obtained an MS (Meteorology) and Ph.D. (Geophysical Sciences) from the University of Chicago. He then joined the newly-formed Department of Atmospheric Science at Colorado State University in 1961. Bill married Nancy Price (from Oshkosh, Wis.) on the 1st of October, 1954. They had four children, Sarah, Anne (deceased), Janet, and Robert. Nancy Gray was very active for many years in Fort Collins community affairs and politics (including serving as Mayor of Fort Collins in 1980-’81) before her death in 2001. 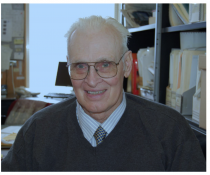 Bill was a faculty member at Colorado State University from 1961 through his formal retirement in 2005. But after retirement, he continued his hurricane and climate research as a Professor Emeritus until his recent passing. Gray initiated seasonal hurricane forecasts for which he became well known with extensive media coverage in the 1980’s and 90’s. Gray graduated 70 masters and Ph.D. students. 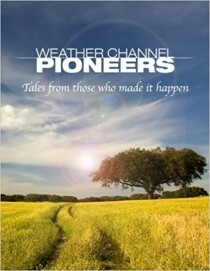 Many of his ex-graduate students have become very prominent leaders in the field of tropical meteorology today. His last graduate student, Phil Klotzbach has very successfully continued these seasonal forecasts since 2006. He worked many years with the UN’s World Meteorological Organization (WMO). He initiated and organized the first WMO International Workshop on Tropical Cyclones in Bangkok in 1985. He traveled the world and maintained collaborations with prominent researchers in the field of tropical meteorology throughout his career. To recognize his leadership and distinguished service in the field of tropical meteorology, he received many professional awards, including the first “Robert and Joanne Simpson Award” (2014) from the National Tropical Weather Conference. Gray had strong disagreement with the science behind the human-induced global warming hypothesis (AGW) and devoted the major portion of his recent years to research. Gray is survived by his two daughters, Sarah (of San Diego) and Janet (of Fort Collins) and his son Robert and two grandsons Mason and Liam (of San Diego). Details about a celebration of his life as well as donations in his memory will be forthcoming and posted on the Bolender Funeral Chapel (Fort Collins) website. I have followed Bill and his approach for tropical forecasting for many years, I used it as a model for my snow and seasonal forecasting efforts. I have attended numerous conferences and discussed the THC, AMO and climate cycles at length with Bill. I was honored to be asked along with Neil Frank and Bill Read and Phil Klotzbach to participate in the conference and tell the attendees about our experiences with Bill over the years and then awarding him the first ‘Robert and Joanne Simpson Award’ at the National Tropical Weather Conference in 2014. 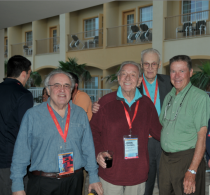 Here I am with Bill along with two other long time heroes Neil Frank and John Coleman at the first night of the conference. I will never forget the man, his legacy, his intellect, energy and enthusiasm and his friendship. We will sincerely miss him.